We are extremely excited and honor to welcome Mr Bokjin Park from South Korea to participate the inaugural Penang 100, the first Penang 100km Ultramarathon. Mr. Park, who will be on his first trip to Penang which is also his first trip to visit Malaysia as well. Born Sept 8, 1952. Studied English Literature at University. First marathon was in the year of 1998, Ran the Boston marathon in 2002. Personal best record for the marathon 3h23m03s. Vice President and Director of International for KUMF (Korea Ultra Marathon Federation) 2006-2010.
International Association of Ultrarunners Asia Representative since 2012. Korea Ultra Marathon Grand Slammer ( Ran 308km, 537km, 622km across the Korea peninsular ). 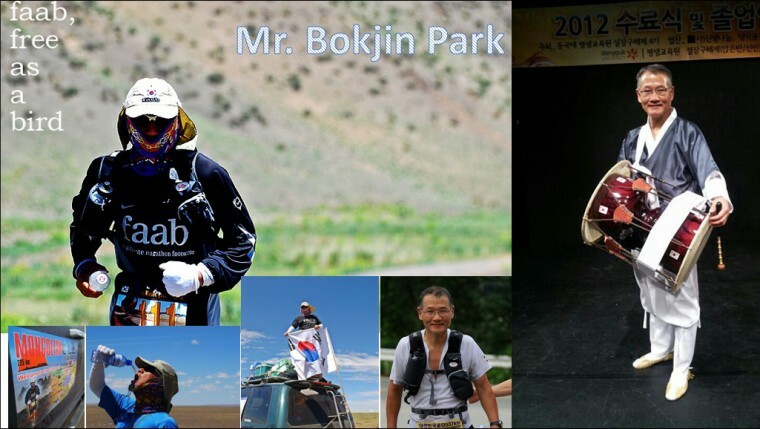 Mongolian Gobi Ultramarathon 225km Co-Founder. A man of many talents, though his specialty is ultra-running, he do practise Korean Traditional Percussionist, he also write beautiful Marathon Essays and he also the Marathon Footwear brand " faab " manufacturer and supplier. Thank you Cititel Penang, an architectural landmark by itself in the city of Penang and standing a magnificient 16-storey high in the heart of George Town, the best propositioned hotel in Penang Island to accommodate Mr. Park stay during his visit for Penang 100 Ultramarathon. Thanks to Mr. Ng Seow Kong invitation, this will give Malaysia, the young but growing ultra community an exciting opportunity to know more about ultra running.